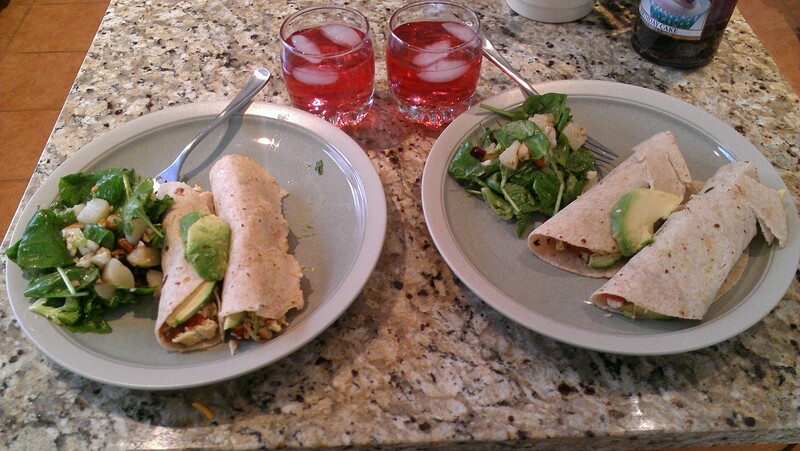 When my wife’s telecommute schedule coincides with mine, I like to make us lunch. Today’s “honey I shrunk to waistline,” offering? Egg & avocado brunch tacos on whole-wheat tortilla, with spinach and pear salad made with dried cherries, diced almonds, broccoli & cauliflower tossed with lime vinaigrette. Served with blueberry hibiscus tea. Eggs are nutritious, but terrible for your cholesterol, and the egg board’s propaganda that they have “balanced fats” is wishful thinking at best–unless you serve them like this. This all comes to nearly 600 calories–far more than I usually allocate to lunch–but I’m working at my treadmill desk today and this is about as nutritious as food gets–and as delicious. Honestly, one taco would have been plenty, and then it would come in at around 350 calories. What’s especially nice about this meal is that it’s not only a feast for me, it’s a feast for the helpful bacteria living in my gut, without whom I would be doomed where I stand. Cell-for-cell, they outnumber me three to one, so it pays to keep them happy. Almost everything we know about them, we’ve learned in the last twenty years, and the findings are transforming our understanding of nutrition and diet, month after month after month. Eating yogurt or the odd probiotic doesn’t cut it. What you feed these guys is at least as important as what you feed yourself, and it has a huge impact on what your body gets from its meals and how it puts it to use. The science is still in it’s infancy, but one thing is crystal clear, we in the west eat far too much meat and dairy, and it’s making us very sick. Check it out and let me know what you think. Are you a vegan or a veg? Do you swear by the modified Akins? Did your grandma live to be a hundred eating pork rinds and deep fried twinkies? Leave a comment and tell me what you think, and until next time, bon appetit!